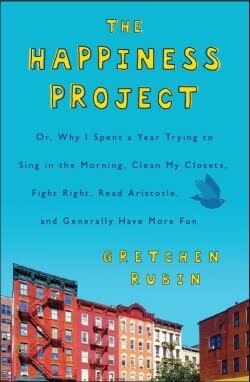 As mentioned previously, from England, I have been reading The Happiness Project. It is a type of Eat, Pray, Love sort of book, only Gretchen (the author) didn't get all self-indulgent and take off for a year. Her pursuit of "Happiness" and fulfillment and love and meaning and purpose took place at home. With her husband, two young daughters, extended family and job still firmly attached to her life. She wanted to be happier. So she researched happiness and went after it, methodically. I can appreciate her methods. I underlined half the book. Of course, because I'm a Christian, I know that that our purpose on earth isn't to be happy. It's to be holy. But there's something to be said for being a happy Holy person, no? Some of us struggle with putting on a happy face (regardless of Who is living in our heart.) Gretchen was one of those people and she wanted to do something about it. So she identified 12 areas in her life that could be adjusted and she worked on it - one area per month. And, while I'm not pursuing happiness per se, I am looking to live the life God called me to live with less fear, less guilt, less regret, less anger, more enthusiasm and more love. So I think I may work on a Happiness-ish sort of Project too.